The PokerStars Turbo Series is here! Get ready for 74 dynamic events! Experience Turbo and Hyper-Turbo versions of popular poker formats as you challenge for more than $15,000,000 in guarantees. There will be tournaments for everyone’s bankroll! 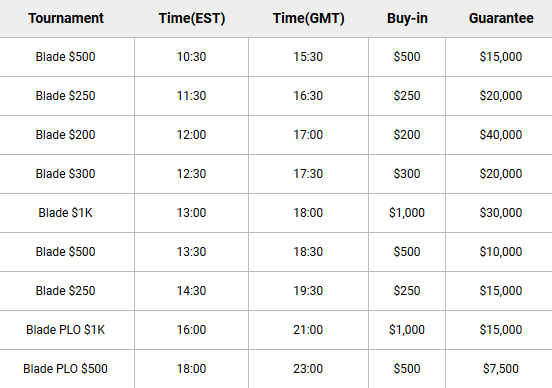 Buy-ins start from $11, but there will be low-cost satellites and qualifiers – including $2.75 Turbo Series Spin & Go’s. The biggest attraction will definitely be Twin Turbo Main Events on March 4, with $55 and $1,050 buy-in levels, and $3,500,000 in total guaranteed prize money. Don’t miss this great Series. If you still do not have an account at PokerStars it’s the right time to register and join the TurboSeries action. Don’t forget about the Welcome Bonus which is waiting for you. For more information, visit our site. 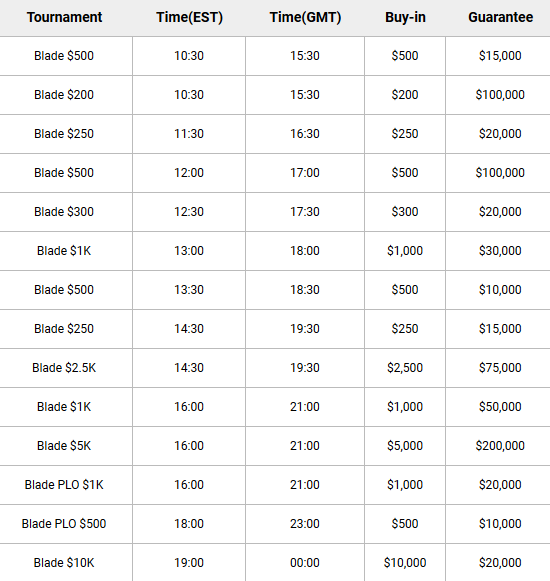 Blade Omaha Series starts from today on GG Poker! If you are Omaha fan, waste no more time, sharpen your poker skills and jump into the action! Blade Omaha Series – more than $8M in guarantees every month! GG Poker brings more excitement to the tables! This time they are ramping up the MTT Omaha action with the all new Blade series! Starting January 14th, you’ll find 2 new daily Blade PLO tourneys, with $10K and $20K guarantees! This provides more than $8M in Blade tourney guarantees every month! Check out below daily and Sunday schedules. Join GG Poker with us by making an account to one of their best skins – Natural8! 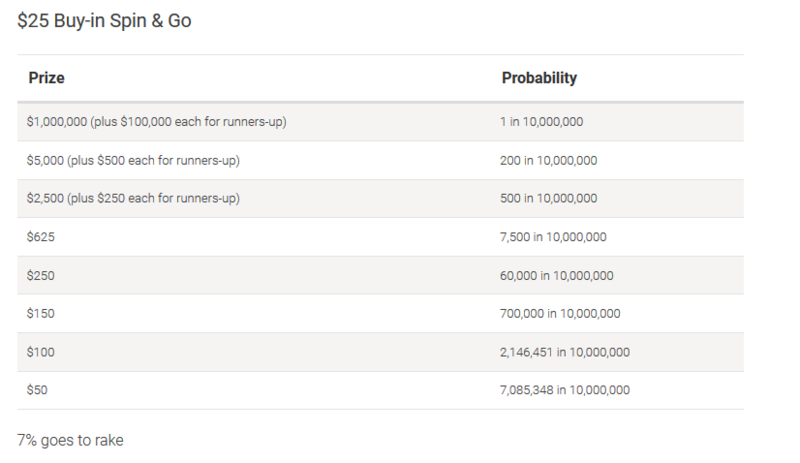 You could win a million in minutes with PokerStars special edition $1 Million Spin & Go tournaments! You can now win a million through Spin & Goes with buy-ins of $5, $25 and $100! Spin & Go tourneys are 3-player Hyper-Turbo Sit & Go tournaments that feature just 500 starting chips. That means that action is very dynamic! At the start of each Spin & Go, watch the spinner in the center of the table to see how much cash you could win. 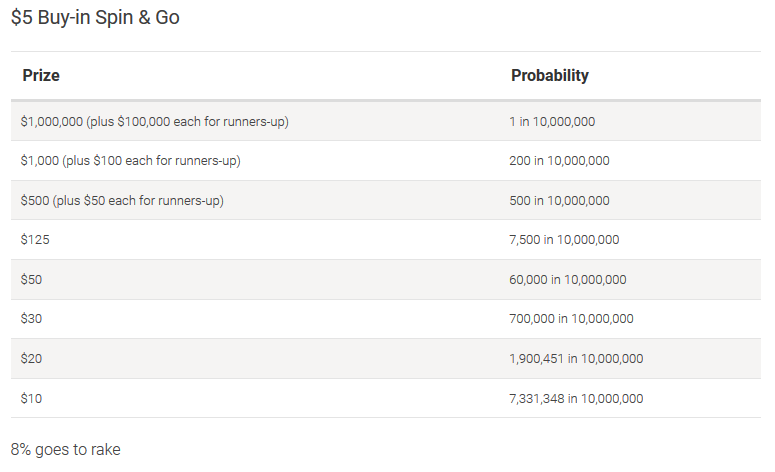 The majority of $1 Million Spin & Go tournaments are played as ‘winner-takes-all’, except for when your Spin & Go hits one of the three highest prize tiers. In these tournaments, the second and third-place finishers also receive a prize. Don waste any more time, join the action on PokerStars and fight for $1M! Happy Hour is back on partypoker! Play fastforward or cash games this week in promotional hours and double your cashback rewards! For ONE WEEK ONLY, Happy Hour is back on party poker! That means that you will have a chance to double your weekly Cashback rewards! Don’t waste any more time and grab your extra points! If you, however, still don’t have an account at partypoker, there are many other benefits waiting for you! Register with us and grab $22 in free satellite tickets with your first deposit! If you still don’t have an account on Betfair its right time to create it! YourPokerCash brings an exclusive BETFAIR FREEROLL SERIES for new players registered with us. If you create an account on Betfair with us you will have a chance to take part in 4 exclusive freerolls this month. These weekly freerolls are for our players only! The prize pool for each tournament will be €500! All you have to do is to create a Betfair account with us and become a real money player. That means that you have to make a deposit before taking part. It can be the minimum amount! But before that, be sure that you signed up correctly with us! -First of all, you have to clear cookies in the browser you are using. -Once you are on our site and Betfair offer review, click red “SignUpNow” button. After you registered properly, you will be able to find our weekly freerolls in the lobby under the name: Exclusive €500 New Player Freeroll. Dates for the January are January 6th, 13rd, 20th, 27th. Beginning time is 06.00 PM CET. You can find passwords for these tournaments if you visit our FreeRoll Page. If you have any problems with registering, do not hesitate to contact us! Here you can check out other great reasons for joining Betfair!